Bond Economics: Why Are MMT Critiques Generally Terrible? Why Are MMT Critiques Generally Terrible? The deluge of bad Modern Monetary Theory (MMT) critiques continues. Although it is possible that there are some diamonds in the rough, all the articles I read were downright stinkers. They were so bad that I refuse to dignify their existence by even citing them. However, as someone in the MMT camp, I just want to give a few pointers for my readers as to why those critiques stink. There certainly are legitimate critiques of MMT, but they are hard to find. Even academics end up citing poor critiques written by non-MMTers; nobody can be apparently bothered to read the MMT academic literature. Which is a rather troubling commentary on the diseased state of modern academia (speaking as a hardline old school ex-academic). In this article, I just cover the ludicrous arguments; I will let the reader try to find some reasonable ones elsewhere. I am in the middle of developing an investment accelerator model within my Python SFC model framework, and I do not want to waste my time beating up on clowns. Unlike modern academics in a certain discipline, we need to be careful with regards to what we are talking about. We really need to strongly distinguish between real world policy recommendations versus economic theory. The real world is complicated. Economic models have abstracted away that complexity so that we can make definitive statements about their simplified world. We cannot muddle those two modes of thinking. I will discuss the real world critiques first (as that is of the most general interest), then digress to the discussion of theory, which really is only of interest to those of us who care about economic theory. The constraint on fiscal policy for a sovereign with a freely floating currency (and controls its central bank) is inflation. Saying that "inflation is a constraint" is a fancy-pants way of saying "too much inflation is bad, so at some point, you gotta stop spending." So arguing that "implementing MMT" will lead to inflation (or hyperinflation!) is ridiculous: the whole premise of MMT is that "too much" spending leads to "too much" inflation, and that is to be avoided. The only real debate is how much spending is "too much." As will be discussed next, actual policies advocated by MMTers are not particularly scary. Alexandria Ocasio-Cortez ("@AOC") is a MMTer. Alexandria Ocasio-Cortez is also some kind of socialist. This does not work; like most other economic schools of thought, MMT is not tied to a particular part of the economic spectrum. For example, both Paul Krugman and John Taylor are neoclassical economists, yet they are not exactly on the same page for economic policy. If we return to MMT, about the only part of the spectrum that will not be happy with MMT are hard money advocates; one of the early texts by Warren Mosler (a "MMT founder") is "Soft Currency Economics." I am a Canadian Prairie Populist, and from the relatively free market of that spectrum. Almost nobody is going to have a clue about Canadian Prairie Populists, and I will not bother explaining. I will instead merely state that if I translated my views into the American lexicon, I would pass as Eisenhower Republican from the perspective of economic policy. If you believe that the Supreme Commander of the Allied Expeditionary Force (SHAEF) is some kind of dangerous leftist, that is your problem, not MMT's. The advocacy of a 70% marginal tax rate (as per @AOC) is not really a MMT policy; like practically everyone, MMT authors presumably favour progressive tax rates. (Even a flat tax is progressive; every system that I have seen proposed includes a 0% bracket for low incomes.) The level of those tax rates is not a point of MMT dogma. I live in Quebec, and the all-in marginal tax rate for almost any professional hovers around 50%. I think that level is about the highest rate that can be sustained politically; I have my doubts about very high rates aimed at extremely high incomes. If we look at the MMT literature, there's only a few policy platforms that are tied to the theory. Job Guarantee. This is the most distinctive MMT platform. It is an extension of the welfare state, but it is actually replacing having people on welfare paid to do nothing - which used to be a big deal among conservatives. The wage paid is a key policy variable, so the effect of its introduction depends on what level is chosen. However, a Job Guarantee is far more sustainable economically than a Basic Income, since any overheating of the economy automatically drains the Job Guarantee pool. Eliminating the possibility of central government (Treasury) default. This is my personal hobby horse, but I think the idea floats around in MMT articles in various forms. This could be accomplished by just giving the Treasury an open-ended overdraft at the central bank; other options could be a more root and branch reform of government finance. It tells us all you need to know about the people who are allegedly worried about a fiscal crisis that they would scream very loudly against eliminating the possibility of government default by construction. It is a weaker variant of the next option. Possibly: Eliminating Government Bond Issuance, locking rates at 0%. This is hugely controversial with mainstream economists, who are deeply attached to interest rate policy. I would note that there is not a 100% consensus in favour of the policy among MMTers, although there is a consensus about how to analyse what the effects are. There are other policies that are advocated by particular MMTers, and/or MMT activists. From my perspective, I don't think that it is safe to say that everyone who is in the "broad MMT camp" will necessarily agree with policies. I normally stay clear of policy advocacy; I am more interested in writing about theoretical squabbling. The standard complaint about MMT by non-MMT academics is that there is nothing new there. I would first note that I am a very ex-academic (although I may present papers at a MMT conference in my doddering old age). Academic turf wars are very exciting to the academics involved, but are nothingburgers to everyone else. I am obviously sympathetic to MMTers, but I lack the access to the research library that would allow me to easily do the reference chain analysis I did back when I was in academia. As I describe below, the contributions of MMT -- as presented by MMT academics -- seem plausible. If you are an academic in economics, go to the library and do your own %$& research. In any event, most of the academic attacks on MMT came from post-Keynesians, who later authors then quite often cribbed. If we put aside the uneasy relationship between "MMT" and "post-Keynesian" economics, we can then turn to the differences with the neoclassical tradition ("mainstream"). Speaking as a mathematically-literate outsider with no dogs in academic turf wars, the advantages of MMT/PK approaches over neoclassical are massive and glaring. For example, I am working on a book on the theory of recessions. I want to be complete as possible. What can the neoclassical camp give me? Econometric analysis that is just stock mathematics, and not tied to any theoretical school of thought. In other words, a theoretical contribution that is pretty close to nothing. Admittedly, one of the reasons why I decided to focus on the topic of recessions was that the neoclassical literature was so useless that I could in good faith largely ignore it, and so reduce the writing time for the book. However, recessions are hardly an obscure theoretical topic. Circling back to our main topic, we need to discuss fiscal policy. One could argue that MMT is not a huge advance over post-war Functional Finance. Meanwhile, the current neoclassical tradition is based on a growth that started in post-war Keynesianism. The argument is this: the neoclassicals believe that they progressed on the old Keynesians; MMTers would agree that they regressed. 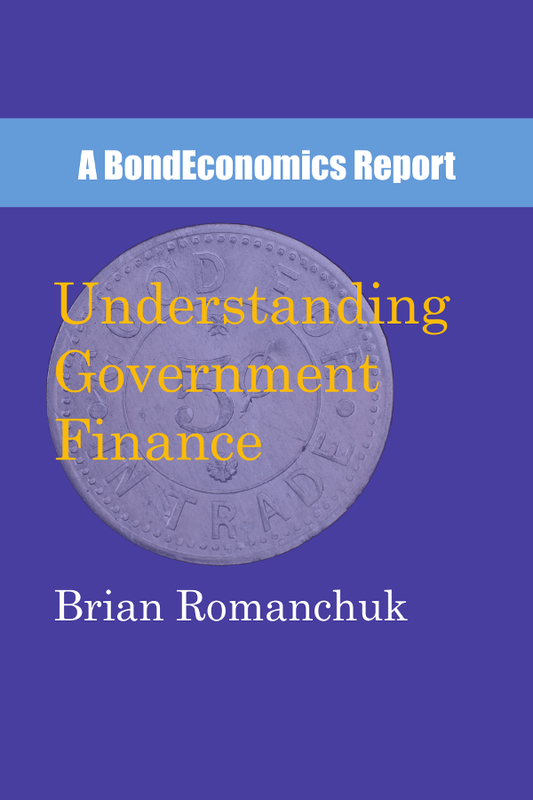 I have written dozens of articles on this subject already; in fact, it is probably in my book, Understanding Government Finance. In my view, the debate largely revolves around two theoretical points: overlapping generations (OLG) models, and the inter-temporal governmental budget constraint. I discuss these in turn. The neoclassicals appeal to OLG models as a way to "prove" that government debt "puts a burden" on future generations. (I discussed these models various times, such as here.) In summary, I believe these models are contrived, and just designed to give the desired result. One of the standard complaints I have seen by apologists for the mainstream (such as on Twitter) is that MMT is "not empirical." Meanwhile, the mainstream appeals to models that cannot be fit to data to prove that inter-generational debt burdens exist. Very simply: how do we fit an OLG model to the post-World War II government debt trajectory to determine which "generation" was "burdened" by debt? As for the inter-temporal governmental budget constraint, it is a mathematical constraint that is imposed on dynamic stochastic general equilibrium models. It allegedly binds fiscal policy, and the presumption is that this constraint also binds in the real world. The objection is straightforward: it is extremely hard to find a convincing reason why the constraint should even be imposed on the mathematical framework in the first place. For 99% of papers, the constraint in imposed on purely arbitrary grounds. I would note the article by Alexander Douglas about a game-theoretical explanation for the constraint. I have some concerns about the setup of the game -- does the private sector really have the discretion that the model suggests -- but that would require a longer explanation. I think I can see the real reason for the existence of the constraint, and that reason is the Fiscal Theory of the Price Level (FTPL). The short summary of the FTPL is that if government debt levels are not sustainable, the price level "goes to infinity" now. On a less extreme basis, the price level is determined by the stance of expected fiscal policy. This is directionally the same as Functional Finance. If the price level at time t is determined by the stance of fiscal policy, the price level at time t+1 is determined by the stance of fiscal policy at time t+1. The implication is straightforward: all the neoclassical argle-bargle about monetary policy is just plain wrong: inflation control is 100% a question of fiscal policy. The FTPL is either trivial or wrong. It is trivial since expected primary surpluses cannot be observed, and could only be backed out by looking at the price level: so nothing is explained. Furthermore, we do not see massive instantaneous jumps in the price level every time a controversial tax package is voted on, or budgets announced in parliamentary governments. Once we throw out these theoretical constructs, the mainstream is stuck with almost no viable theory about the limits of fiscal policy (beyond multiplier analysis, which ends up being hard to empirically distinguish from Functional Finance). All we are are left with are trivial analyses of debt trajectories in implausible economic models ("assume that debt levels rise by 6% forever, and nominal GDP growth rises by 4% forever , and there are no feedback loops between those variables"), or campfire stories about "bond vigilantes" or "unsustainable debt levels." The decades of embarrassingly bad predictions about Japan from various mainstream sources explains why bond market participants like myself never took mainstream assertions about fiscal policy too seriously. Although I am sure that legitimate critiques of MMT out there, good luck finding them. "Why Are MMT Critiques Generally Terrible?" Because MMT is based on a description of how the monetary system works and accounting and about the options available to a currency issuing government. And then builds from that some logical conclusions based on what are pretty reasonable estimates of human behavior. So what would be promising ways to criticize MMT? Show that the description is wrong is one way. Show that the accounting is wrong is another. Argue that there are no assumptions that can ever be made about human behavior and therefore the accounting identities are useless. Argue that government doesn't and can't have the powers MMT describes. Show where the logic falls apart. You would think it should be easy to do. But apparently it isn't. If non-MMTers want to debate, I think most should stick to the policy proposals. The obvious question is: which ones? The proposals for the US are likely radically different than Canada; for example, we have a relatively properly functioning medical system up here. If we want to debate theory, I think we’re stuck looking at the academic literature. Whee, what fun. This debate *should* have been happening in academia, but the mainstream broke the academic system by ruthlessly excluding the heterodox authors. Well, they have reaped what they sowed (which I think is going to be the title of a followup...). Alas, I forgot the 'Egmont' critique. MMT is wrong just like all the others, the Keynesians, the Austrians, Marx and Walras, and everyone else besides Egmont. They are all wrong and what is more- they are all morons- all of them. Terrible people posing as social scientists, spreading their pernicious lies and not accounting for profit and no doubt pocketing lots of this profit while pretending to ignore it. I guess it is a logical way to criticize MMT, but it doesn't seem the most popular way among mainstream economists. Thank you for continuing to report on the state of the debate on MMT, and the nature of its reception in the mainstream press and on social media. Mitchell has certainly written that. If one believes that the economy can function with the risk-free rate at 0%, then yes, interest payments are a purely optional cost for the government. Are they a form of welfare? I think that one could debate it either way. The government needs to provide risk-free assets to reduce the risk of financial crises, so investors in them are doing exactly what they are designed for. The sticking point is that it is not clear that there is a 100% consensus among MMTers that interest policy is entirely ineffective. If we want to narrowly define “MMT” as what a few people - e.g. just Mosler/Wray/Mitchell - believe, we can more clearly narrow down MMT. But where does that leave anyone who disagrees on some points (like the usefulness of interest rate policy)? Unless we want to get ridiculous and create 100 schools of thought (which is pretty much what the post-Keynesians did), you have to accept that there will be some ambiguity in MMT definitions. Things will get easier when the Wray*Mitchell text is out. "The constraint on fiscal policy for a sovereign with a freely floating currency (and controls its central bank) is inflation." I would agree with you that this is a good way of putting MMT ideas. However, I have a feeling that MMT proponents themselves would not agree with that sentence (but I may be wrong). What is the source of that claim? A MMT book or something? That’s pretty much a key plank of Functional Finance, just my wording. I linked my primer, which was based on Lerner’s key article. I'm a neophyte for sure, but isn't the inflation constraint in MMT elevated above of a debt constraint or a money supply constraint? To me that is a key, if not THE key, insight of MMT. From a MMT perspective, the only true constraint is inflation. What are the limits to money or debt creation? Both are ultimately accounting entries. There is the political sphere where, in principle, everybody is admitted. The currency in the political sphere is opinion. Opinion is different from knowledge and the fact of the matter is that it is most of the time false or merely commonsensically true. The discourse in the political sphere has not much to do with truth or reality but with myth, storytelling, gossip, second-guessing, propaganda, belief, paranoia, disinformation, and entertainment. The very opposite of opinion is knowledge. Science is about knowledge. Science is binary true/false and NOTHING in between. Non-science is the swamp between true and false where ‘nothing is clear and everything is possible’ (Keynes). The distinction between science and non-science corresponds to the ancient Greek’s distinction between episteme (= knowledge) and doxa (= opinion). Science is for 2000+ years defined by material and formal consistency. Logical consistency is secured by applying the axiomatic-deductive method and empirical consistency is secured by applying state-of-art testing. What the general public cannot see is that economists do not have the true theory. The fact of the matter is that the major approaches ― Walrasianism, Keynesianism, Marxianism, Austrianism, MMT ― are mutually contradictory, axiomatically false, materially/formally inconsistent and all got the pivotal concept of the subject matter ― profit ― wrong. Functional finance argues, in essence, that the only normative constraint on government deficit spending is the social need to avoid rampant inflation. I suspect MMT uses different operational assumptions then those who are developing FTPL with ZLB conditions but I'm still learning how to decode the terms defined in FTPL theories. Note that this is NOT a question about opinion or political preferences but a clear-cut true/false question which can be unambiguously decided according to well-established scientific criteria. The answer is that the MMT equation is logically/mathematically false. Because of this, the whole analytical superstructure of MMT is false.#3, #4, #5, #6, #7 This settles the matter. MMT is dead and buried at the Flat-Earth-Cemetery just like Walrasianism, Keynesianism, Marxianism, and Austrianism. This, though, does not stop Brian Romanchuk, MMTers, and the rest of economists from blathering as if there were no tomorrow. In order to understand this phenomenon, one has to drop the presumption that economics has anything to do with science or that economists are scientists. For 200+ years now, economics is a fake science and economists are either clowns or fraudsters in the political Circus Maximus. I was wondering what you thought was the best critique of MMT you had read? In my opinion it was Frances Coppola's "Myth of Monetary Sovereignity". I know you addressed this in some detail, however I thought you were dismissive about developing countries. "There are perhaps some claims within the article regarding developing economies that are worth debating, but they are not of interest to myself. " You're casually dismissing a huge proportion of the world's population right there. I would say if MMT really wants to get widespread acceptance it needs to turn it's attention away from USA, Japan, UK, Canada and towards developing countries with detailed case studies and policy recommendations. Interested if you've had any more thoughts on this. I never looked at emerging matkets, and so did not have a feel for the issues. Although it’s somewhat harsh, I would note that the original Coppola article had a howler of a statement about Australia. She deleted tfe point in response, but she demonstrated the problems you face when you write commentary out if your area of expertise; anyone familiar with developed country macro would not use Australia as an example of current account deficits limiting action. There are MMTers who discuss developing countries, but not me. I can’t really offer useful commentary on them, so I keep my mouth shut, That’s my personal preference, and not a MMT stance. As for the Coppola article, even without the issue of Australia, it was weak. It was so weak that I didn’t see the point of re-reading the corrected version. As little as I know, the problem with MMT is not so much the theory, but how to get from here to there. If it requires people to have a religious conversion to a system opposed by their imams (figurative), it is likely to remain in the realm of academic disputation. A job guarantee is imminently practical in the ways you describe, and can be sold on its merits. The question of direct spending has a serious problem with the calcified rhetoric around federal debt. It seems like the spending could be done by the Fed directly purchasing development bonds. The Fed has opened the door to this with its bailout measures and its QE purchases. Aside from the hysteria over an inflation that never happened, nobody noticed. Were they to purchase municipal bonds, or bonds dedicated, say, to an electric grid, the effect would be the same as direct government spending, it would not appear on any accounting of government debt, the increments of spending would be discrete enough to allow control of their inflationary effects, and private investors would have little to belly-ache about, considering their own enrichment from the QEs and bailouts. In the 50's, the federal government directed investment by private banks by jawboning, basically, but the time has passed when they will take direction rather than give it. Obviously it is a stretch now to think the Fed would act in this way, but in the context of the next crisis? Could happen. Have you seen the anti-MMT piece called "turtles all the way down" (the MMT discussion is towards the end of his post) https://www.hussmanfunds.com/comment/mc190204/ ? To be honest, I got the impression that it wasn't fully moronic. He almost seemed to be grasping towards but missing the essence of the argument. He finished with, -------------"In my view, real, thoughtful economic analysis asks questions like “What are the resources”, “What are the constraints, and where are they binding”, “Where are the barriers, distortions, or coordination failures?”, “What are the externalities”, “Who bears the costs ?”, “What relationships are actually true in the data?”, “What are the incentives and how will this policy change them?”, “What are the unintended consequences?”, and “What are the most productive uses?”--------I guess the point is that MMTers say that our economy does have chronic coordination failures that lead to underemployment. The fact that he missed that suggests that the MMT argument needs to be clearer that that is what this is about?? ?